1) Rocks - Preferably not sandstone styled rock as this will explode in the fire. Use volcanic rock. Some people use irons as well however these can tend to burn the Hangi and don't hold heat as long as rocks do. 2) Steel Baskets - Steel bread crates can be used, even steel chicken wire can be used to wrap the food and placed on the rocks. 3) 6-7 Potato Sacks - Any type of cloth styled potato or sugar sacks (If you have access to Banana leaves, use them as well. 4) White Bed Sheets - Preferable mutton cloth but bed sheets will do. 9) Tin Foil - Use this to hold food that may easily slip through the crates. 12) Firewood - A variety of small to large slow burning wood. Enough to keep a fire going for at least 2 hours. Don't use treated wood!!! Usually most of the preparation is done the night before so that everything is ready for the morning lighting of the Hangi. However if you don't have enough large pots to hold the peeled vegetables in (must be left soaking in water) then peel them and prepare them in the morning. Use your basket size as a measurement to size up the hole you need to dig. Make the hole a bit bigger than your basket size so you can tuck the sacks and mutton cloth down the side. The hole doesn't have to be very deep, probably just enough for the rocks and about a third the depth of you crate. Some people differ in this next part as to preference but most Maori build the fire over the hole and others build the fire on the side of the hole. We will explain the fire over the hole technique in this site. Now that you have dug your hole, you need to fill the hole with screwed-up newspaper as this will be used in the morning to ignite the fire. Next place the small kindling wood on top of the paper and build a typical fire placing bigger and bigger pieces criss-crossing by layer until all the wood is used. Then stack the rocks on top of the wood. Cut the sacks open down the two sides so that they open up to their full length and place in a full 44 gal drum of water to soak overnight. Place mutton cloth or sheets in the drum as well. Place a protective cover over the fire-stack to keep the overnight dew off to ensure a dry start in the morning and then you are ready to roll. The whole process from the fire to the completing of the cooking will take about 6 hours. 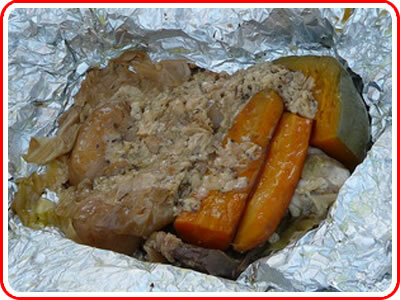 So pace your day out so that the Hangi will be ready for when you need it so it stays hot. Take a rolled up piece of newspaper and light the screwed up newspaper underneath the fire-stack. Allow to burn until all the wood is embers in the hole. This should take about 1 1/2 - 2 hours. Use the shovels to reposition any rocks that fall out of the fire. The rocks should burn almost white hot. Once the fire has burned down, use the shovels and rakes to scoop out any smoking embers so that there is only rocks left in the hole. Rake the burning embers away and dowse with the hose. Any ashes left floating around can be dissipated by a quick spray of the hose on the rocks. Flatten out the rocks as much as possible and place the basket on the stones. Get the wet mutton cloths or sheets and lay them over the basket allowing the edges to go down the sides of the hole. Immediately before doing this though you need to give the stones and basket a quick spray with the hose to create some steam, then immediately place the cloths over-top. On top of these cloths, place a potato. This is used as a kind of indicator for later to tell you whether everything is cooked. Place the wet sacks on this , layering them as to cover the basket but dot allow them to go down the side of the basket so that they lay on the top of the ground. Place the dirt on top of this covering the entire area and sealing off any places where steam is escaping. The cooking time for one basket is around 2 1/2 - 3hours but it doesn't hurt to leave it in for 3 1/2 - 4hours. 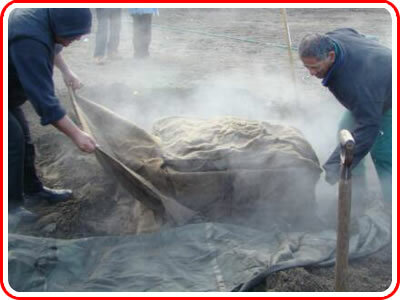 It is quite difficult to overcook a Hangi as the longer it is in the ground the more the rocks cool (a bit different to an oven which stays constant in temperature). Uncover dirt from the sacks and peel back the sacks being careful not to spill any dirt into the basket. Check the potato to see if it is cooked. Remove the cloth and use the sacks as protection to hold the hot basket. Take to the kitchen and serve.